As much as we enjoyed indulging in the Thai Royal First Lounge, my father and I had to leave rather quickly. Our departure gate, C10, was quite far away, and we nearly had to sprint just to get there in time. Out of breath and in a tizzy, we arrive to find the boarding area a jumbled mess. The ground crew was totally overwhelmed by a mass of economy class gate lice who were all swarming the business line. That chaotic scene wasn’t the best first impression, but we made it on the plane eventually, and settled in for what would develop into an exceptional regional flight. Oof, not the best place for spending 14 hours (although it’s definitely better than economy!). Image credit. But if you take the “new” Thai for what it is, you’ll find an internationally competitive product on par with some of the better offerings in the world. The flight my father and I took between Bangkok and Beijing amounts to nothing more than a regional trip — it’s roughly 20 percent shorter than New York to Los Angeles — but Thai doesn’t hold anything back for those in the premium cabin. This commitment to prestige starts with a new-ish hard product and continues with superb service that the carrier is renowned for. We were treated to the best that the airline had to offer and we weren’t disappointed. I just wish we could have been in the air for longer than four-and-a-half hours. On board its Boeing 777-300ERs, Thai has two business class cabins, with six rows in the forward section, and five rows in the rear. While the set up first appears to be rather dense and a claustrophobic’s worst nightmare, it’s not a total deal breaker. Because the seats are in a staggered configuration, everyone has direct aisle access and there’s lots of privacy… well, except for those in the six “honeymoon” pairs in which only a few inches separate the two chairs. It’s great if you’re traveling with a loved one, but I’d do everything in my power to avoid these if traveling solo. I had selected 19K, which is a bulkhead seat in the smaller cabin. Dad was on the other side of the aisle in 19G. The seat, which is known as a “true window” in such a configuration, is a little bit further away from the aisle. Helping to create separation is a small table that can be used for not much more than storing drinks and dirty dishes in flight… and underneath it lies the foot cubby for the seat behind. Correspondingly, that next chair is positioned closer to the aisle and the accompanying table is up against the cabin wall, and then the chair after that is closer to the window again, and so on. One of the perks of having both a bulkhead and a “true window” seat is that you have markedly more space in front of you. Because you don’t have to squish your legs into a foot cubby built in to the chair ahead of you, you’re given a little bit more wiggle room. When you glance out at the cabin, it’s hard to see other passengers. Obviously it’s not impossible, but no one is sitting in plain sight either. When it comes time to sleep, you feel almost as if you are in a semi-private cocoon… well, assuming that you’re not seated in a “honeymoon seat” or in one of the window seats closer to the aisle. I didn’t mind the style, but I’m also not going to say that it was breathtakingly beautiful either. At the bare minimum, the bones of the seat are good (although far from new; a fresh paint job would be welcomed), and it’s comfortable, supportive, and well-padded. You don’t have to reach too far to get anything either. The seat and entertainment controls, for instance, are right next to you in the side table/console. In case you’d rather not use the remote, the decently-sized high definition TV screen also responds to touch. Given the nature of the seat design, you don’t have to reach too far, and the display is close enough — but not too close — so that you don’t have squint while watching a movie or the moving map. There are two USB ports right beneath the monitor so you can charge your mobile devices once the plane is at cruising altitude, although there isn’t a good place to store them other than on your tray table. It’d be useful to have a shelf of sorts. USB ports are available for your convenience. Adjacent to the seat controls is a universal electrical outlet and a headphone jack, as well as a small storage area that isn’t really wide or deep enough to keep anything of consequence. The seat is unfortunately showing a lot of wear here too. …but I can’t say the same for the well-stocked amenity kit. It was especially generous for an especially short flight. Everything I could’ve wanted was there, like eyeshades and earplugs and moisturizing cream, in addition to other nice goodies, like slippers and mouthwash. The bag too is durable; I’ve reused it a number of times on subsequent trips. Shortly after the boarding process completed but before pushback, flight attendants came around to serve a (non-alcoholic) drink and hot towel service. I wasn’t sure what the beverage was, but it tasted like some kind of sweet fruit tea. The towels were scented nicely with orchids, which seems appropriate for an airline that relies on the flower just as much as it does the color purple when it comes to branding. It was a big package! I’m a fan of Veuve Clicquot, so I ordered that to go with the prawn and chive patty with mushroom sauce. What surprised me was the sheer amount of options for what amounts to a midhaul regional flight. Granted, this is one of Thai’s “flagship” routes, so the service is supposedly better than on more “standard” long hauls, but I have nothing else to compare this experience with…yet! 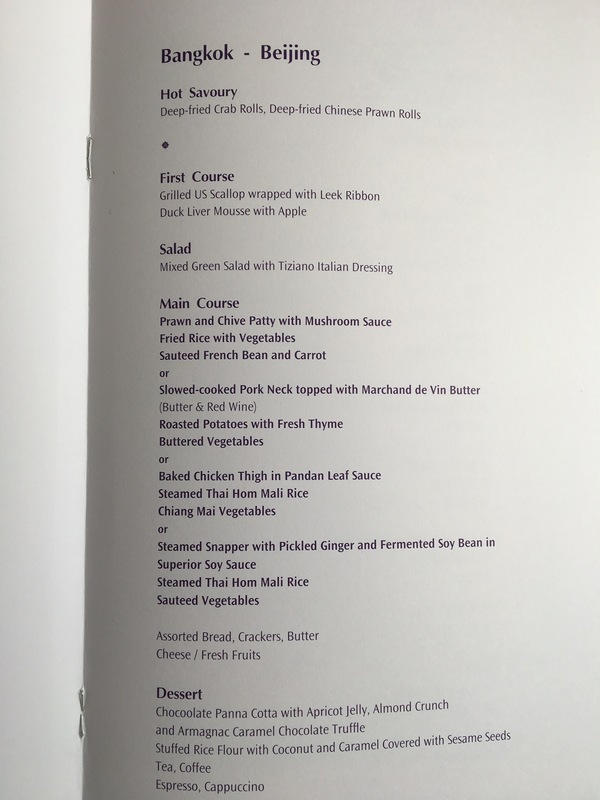 Either way, American carriers are blown out of the water in this dining regard; Thai certainly bests what the Big 3 serve on their premium New York to Los Angeles flights. As the flight attendants finished taking orders and prepared for takeoff, I looked out the window. We were in the between two other 777s, and were cleared for takeoff after a short, five minute taxi. I know this detail may seem unimportant in a review, but the windows at my seat were crystal clear. Being able to look out without gunk and stains obstructing the view made the departure that much more enjoyable. A rainstorm would be coming later in the afternoon, but it was still relatively clear at departure time, albeit with dramatic cloud formations beginning to appear. Thanks to a quick and steep ascent, we were soon at cruising altitude and the seat belt sign was turned off within 15 minutes of takeoff. Flight attendants sprung in to action shortly thereafter. It’s obvious that the meal service is a well-rehearsed performance, and even though I was in the back half of business class, there was virtually zero wait time for anything. It helps that the crew didn’t use carts at all. Rather, they hand delivered everything restaurant style. Lunch started with the first glass of Vueuve Clicquot (with more coming later) and the amuse bouche: fried crab and prawn rolls. While they may not look like much, they tasted divine and were piping hot. I hardly had to chew, and preparing such “melt-in-your-mouth” type food is a remarkable culinary feat, even on the ground. 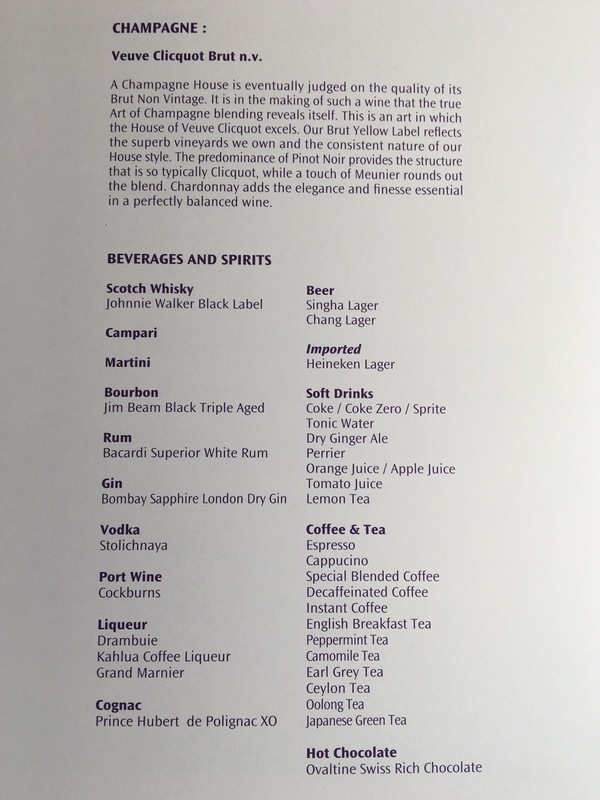 The fact that they were so excellent at 38,000 feet is a testament to the quality of the “chefs” on board. Following that treat was a tray with pâté, aka the “duck liver mousse” on the menu, a scallop wrapped in a “leek ribbon,” and a mixed green salad with Italian dressing. A flight attendant also brought around a breadbasket; I choose the garlic bread. Everything tasted so fresh too! Frankly, I probably could have stopped eating after this tray, but as soon as I was done, it was time for the main entree. It was always a seamless transition between the courses: finish what’s in front of you, clear the utensils, get a drink refill, and then be served the next dish. While the flight attendants didn’t linger or dawdle, I never felt that they were unprofessional or cold or harried. Sometimes service on some airlines might feel as if you’re part of an assembly line, and I think it would be a mistake to characterize the work here as such. Rather, the crew was incredibly efficient, passionate, and well-trained. And besides, the food was just too good! My only constructive comment for the flight regards the presentation of the food. My photos do not do justice to how tasty and how well executed every single dish was. The patties look like mush, but they too had an incredible, melt-in-your-mouth texture and blended a variety of flavors, none of which were too overbearing. It was fine dining disguised as comfort food. The same assessment applies to the bland-looking fried rice: it was seasoned perfectly, and even had a bit of a spicy kick to it. Yum! Even the greens, with a carrot looking vaguely like PacMan, were sautéed without becoming soft and wilty and chewy. But despite how delicious it all was, it might as well could have been a meal from the back based on how it was served. Sprucing the appearance up beyond some fine china would elevate the entire dining experience. 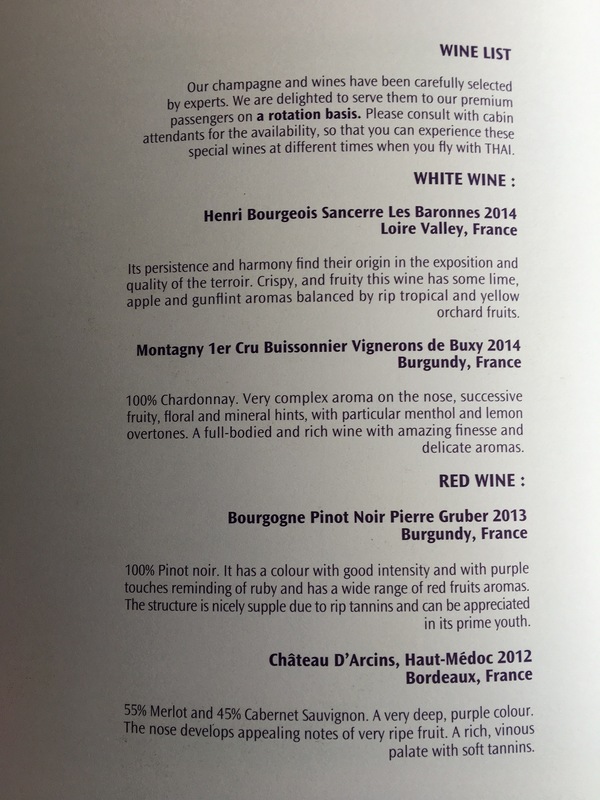 As the flight attendant working my aisle was clearing the last plate, she offered me one final glass of Vueve to complete the service. How could I say no?! The entire meal service, despite including multiple courses, took only a little over an hour. We still had more than three hours to go to Beijing! The crew on my flight was a model of efficiency. Apparently the former King of Thailand is, among many other things, an accomplished jazz musician. After listening to a few tracks, I can say that I’m a fan. He has a neat style! He also has others covering his compositions! After my jazz and champagne session, it was time to go to the bathroom…and then take a nap. The bathroom is a respectable size, and was kept spick and span throughout the flight. There’s wood laminate on the floor and smooth corian-esque countertops, which, and I never thought I’d say this about an airplane bathroom before, gave the “room” some ambiance. It feels much nicer than the industrial closet-styled toilets on other airlines (Ahem, like on the U.S. Big 3). The orchids affixed to the cabinets are thoughtful additions too, as they keep the place from smelling terrible. Ahhh, a nice smell in a place where you wouldn’t expect it! Thai offers lotion and perfume too in the lavatories, both of which are provided by Bulgari. I didn’t use them, so I can’t speak to their quality. I started to watch a movie, (Keeping Up With The Joneses, for those who are interested), but as soon as the cabin lights were dimmed, I fell asleep immediately. Almost everyone else fell asleep too! A genuine, candid photo taken by my father; I was out! I didn’t wake up until we were beginning our descent, and the goofy comedy had been replaced by an austere video documenting the immigration/transit/customs rules and regulations at Beijing Capital Airport. Welcome to China! Also, you will be quarantined if you have symptoms of severe illness. It was a clear day, and I spent the remainder of the flight just looking out the window at seemingly endless apartment complexes. For an idea of what it was like, check out this YouTube video. It’s worth iterating how big PEK’s footprint is. It felt like we flew a mile over the airport before actually touching down smoothly just after 4pm. Although we were in airport airspace, we were still about 150 feet in the air! A row of tails, including our next ride at the far end! We finally pulled in to the gate, said good bye to the crew, and deplaned in a matter of minutes. The “new” Thai business class Royal Silk offering is a winner, especially on short to medium haul flights. The lie-flat seats aren’t perfect, but they are far better than just “good enough,” with comfortable, well-padded chairs that turn in to equally good flat beds. The privacy afforded to those in “true windows” is also appreciated. 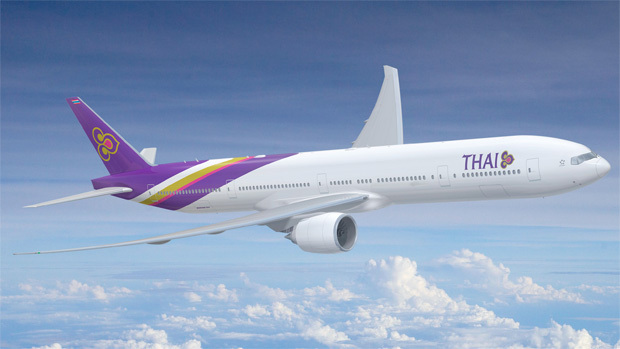 But Thai has always marketed itself as having a superior soft product, and it’s nice to see that despite changes to the look of the cabin, the quality of service hasn’t slipped from its high spot in the rankings. Consummate professionalism characterized the crew, but no one was lacking a kind touch of humanity either. There was the perfect blend of efficiency and warmth, and because of their collective team effort, every premium passenger — including my father and me — left the plane with satisfied smiles. It doesn’t hurt that the food was so delicious too! The staggered seating configuration on board affords privacy to passengers, and the foot cubby in the bulkhead was bigger than average. Furthermore, the seat was comfortably firm and supportive, but not to the point where it was too hard to enjoy. Flight attendants didn’t have to respond to my requests, they just knew what I wanted to do. Talk about thoughtful service! The seats are quite literally ugly. While they’re obviously comfortable, the chipped paint cheapened the overall experience. Don’t fly Thai Royal Silk if you hate the color purple! Have you flown Thai Royal Silk before? What are your thoughts?